This grove of trees was protected by the Garden Club of Oregon and given to the People of Oregon in 1949. The Garden Club started many conservation projects including Operation Wildflower on state highways, “Don’t Be a LitterBug!” campaign. 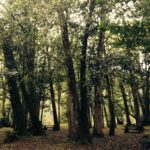 The Oregon Myrtle is a highly valued evergreen hardwood that has played a significant role in Oregon’s coastal economies. 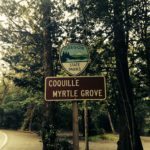 The site is now owned by State Parks as the Coquille Myrtlewood Wayside Grove. Location: Coos County near Gaylord along Hwy 542/ Powers Hwy.